A visiting Canadian friend recently mentioned that Isla Mujeres has textures, many textures — layers within layers. He’s right. We might have been sitting at the Cuban restaurant El Varadero Cocina Criolla, hanging out over the water in a scene reminiscent of the 1951 movie African Queen starring Katharine Hepburn and Humphrey Bogart, waiting, just waiting for the famed boat to putt-putt past. Or perhaps we were at the Captain Dulché Museum and Restaurante on the sand-swept western side of the island. This location, with its marine artifacts, metal sculptures from Cuba, numerous Maya antiques, huge palapa restaurant and rotating bar is so over-the-top-beautiful it could be in any five-star resort in the world. The view towards the Cancún skyline is gorgeous any time of the day. Another day we might have lunch at one of the many Playa Norte restaurants, gazing at the blindingly-white sandy beaches featured in the Corona beer commercials. We like to taunt the beer gods, ordering a Sol with lunch instead of a Corona. A few million dollars in bad-boy yachts were anchored in the shallow waters, allowing guests to swim in the shallow, turquoise water. Playa Norte is the beach preferred by visiting sun-worshipers for the rentable beach chairs or loungers, restaurants, bars and beach vendors all looking to sell their wares. A little further around the corner on the northwestern side of the island are the more public beaches where the local tourists and their families gather to enjoy the deliciously warm Caribbean Sea. Across from this beach is Jax Bar & Grill. Their second-floor patio is a great place to hang out and watch the beach action; a pick-up game of volleyball, a birthday celebration complete with tables, chairs and cake, or the sights and smells from the street-vendors’ food carts. Sometimes we loaf around at Ballyhoo Restaurante located on the wharf, tucked in behind the Pemex gas station on Rueda Medina. On the beach next to the restaurant is a worn, wooden shack where the fisherman clean and sell the day’s catch. 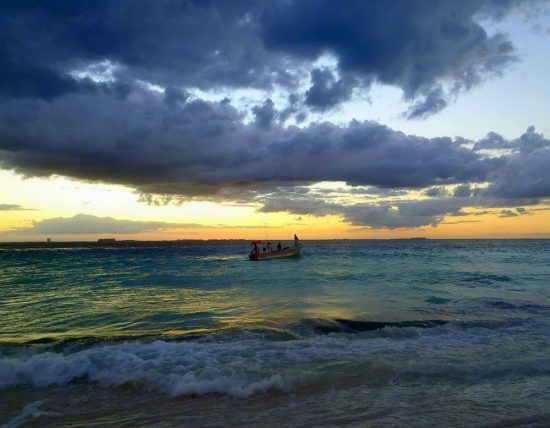 With a backdrop of fishing boats and sandy beaches the sunsets can be downright spectacular. Friends gather to share a dinner, a glass of wine or a cold beer. We prattle in a mix of languages, Spanish, English, a little Japanese, a tiny bit of French, a smattering of German; laughing knowingly about a shared experience, a delay, a frustration, and the fun, oh so much fun. It’s all Isla. Every day brings a new discovery.